Italy entered the colonial age in 1882, with formal annexation of the area around Assab Bay on the western coast of the Red Sea, where an Italian firm had established a coaling station. Three years later the Italians occupied the much finer port of Massawa further north along the coast, taking it without resistance from its Egyptian garrison. In 1889, while Ethiopia fell into confusion following the battlefield death of Emperor Yohannes IV, the Italians expanded their holdings into the coastal highlands and declared them the new colony of Eritrea (from the Latin name for the Red Sea). When the Italians occupied Massawa in 1885 they found the remnants of the Egyptain garrison still in the town, unpaid and unhappy. An Albanian adventurer, Sangiak Hassan, had collected a small army of mercenaries to serve the now-departed Egyptian governor of Massawa. Known as bashi-bazouks, or “crazy heads,” these irregulars included local Eritreans and assorted riffraff from across East Africa and the Middle East. Col. Tancredi Saletta, the Italian expedition’s commander, met with Sangiak Hassan with an offer: rather than fight his motley army, he’d simply buy it. The bashi-bazouks, their weapons, their wives and their children all passed to Saletta. By 1887 the Italians were in combat against the Ethiopians in the hinterlands behind Massawa and at the Battle of Dogali the “horde of bashi bazouks” (as they were accounted in the official report of the battle) accompanying Lt. Col. Tommasso de Cristiforis’ column left the fighting to the Italian regulars. Italy’s defeat at Dogali led to Gen. Antonio Baldissera’s appointment as the colony’s new commandant. Baldissera, former Imperial Austrian staff officer, converted the “horde” to a new regular force. 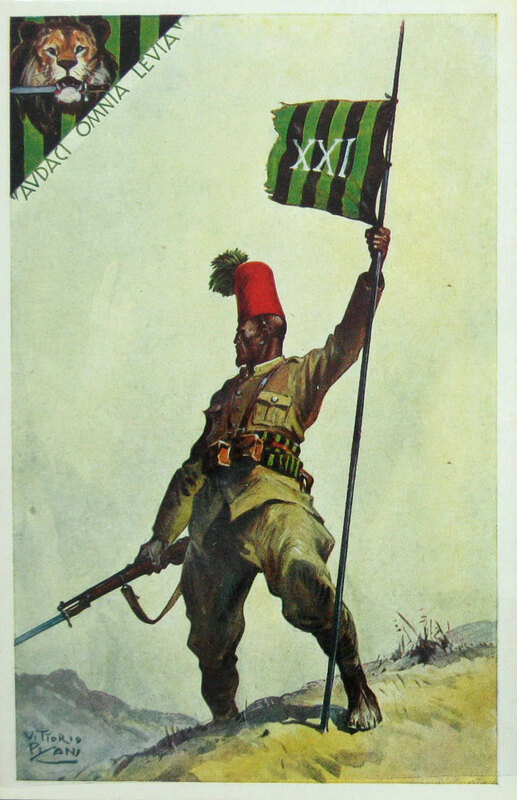 The four new “native battalions” were uniformed and paid soldiers of the Royal Italian Army, referred to as “askari” (Arabic for “soldier”) rather than “bashi-bazouk.” Baldissera took the best of the bashi-bazouks and recruited additional men from Eritrea and from Turkish-ruled Yemen on the other side of the Red Sea. The Italians raised four more battalions in1895 for the war with Ethiopia, along with a number of irregulars. The Eritreans fought bravely, but suffered enormous casualties at the disastrous Battle of Adowa in 1896. Rebuilt afterwards almost exclusively with Eritrean recruits, the native battalions were not deployed outside Italian colonial territory during the First World War, unlike similar British and French formations. They began a long deployment in Libya after the 1912 Italian conquest, fighting Senussi holdouts against Italian rule in a brutal 20-year struggle. During the 1930’s and 1930’s Benito Mussolini instituted a number of upgrades for the Eritrean forces, including cavalry, artillery, engineer and armored car units. When planning began for the Italian invasion of Ethiopia, the Fascists introduced conscription to Eritrea. New recruits helped expand the force to 65,000. Eritrean troops formed two complete infantry divisions, each with 10 battalions, plus four additional separate infantry battalions. Eritrean troops also manned a cavalry regiment plus artillery and other units. In addition to the regular forces, Eritreans were recruited into irregular bande, organized along tribal lines and fighting under Italian officers but with their own African methods. A banda was a company-sized unit, and several of these could be collected in a battalion-equivalent gruppo bande. The men wore their native battle dress (usually the white smock that East African men wear to war) but some received askari uniforms. Apparently including the bande, forty percent of eligible Eritrean men went to war against the Ethiopians. Eritrean regulars signed on for an initial five-year term, with two-year renewal hitches, and thousands of them had at least a decade under the Italian colors including combat service in Libya. And while they fought well when committed to battle, the Italian command seems not to have fully trusted them in action. Eritrean grievances included legalized racial discrimination in the colony and a perception that Eritrean troops drew the most dangerous assignments while politically-correct Blackshirt battalions were spared the risk of heavy casualties. Italian use of chemical weapons, particularly against civilian targets, appears to have greatly disturbed the Eritrean troops and a mutiny broke out after poison gas was deployed at Ganale Doria, with several hundred Eritreans deserting. The Fourth Gruppo Battaglioni, a three-battalion regimental equivalent in the 2nd Eritrean Division, experienced massive desertions even among men with 20 years of service or more. These came despite a well-founded fear among all Italian troops, both white and black, of murder and mutilation at the hands of the Ethiopians, who routinely sliced off the right hand and left foot of captured Eritreans. At least 5,000 Eritreans were killed in action during the invasion of Ethiopia. Most Eritrean regulars carried the old Vetterli-Vitali Mod. 1870/87 rifle, a 10.4mm four-shot black-powder repeating rifle considered hopelessly outdated by the Royal Italian Army during the First World War. A number of European armies favored equipping their African native forces with such weapons, feeling that the huge bullet had a better chance of stopping a charging spear-wielding enemy. In the harsh reality of war, where racist assumptions mean little, the typical Ethiopian soldier had a better rifle than his Eritrean adversary. A few favored units had the same Mannlicher-Carcano Mod. 91 rifle as the regular and Blackshirt battalions, and this would become standard for Eritrean battalions by the time of the 1941 British invasion of Italian East Africa. 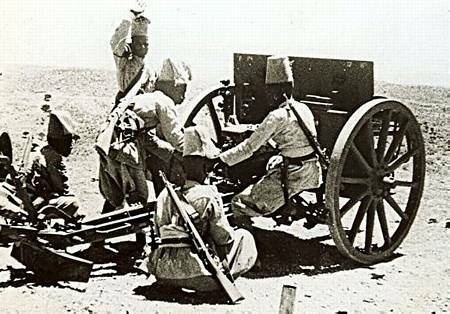 Eritrean machine-gun platoons had the older-model Fiat-Revelli Mod. 1914, a weapon still found in regular army units but being steadily replaced by a more modern (though still inadequate) Breda-made machine gun. Eritrean Askaris wore a khaki uniform patterned on that of the Italian regular army, but with a red tarbush (a taller version of the fez) as their headgear. For ceremonial occasions most battalions also had a white uniform based on traditional East African garb. Though a number of post-war Italian historians have chosen to overlook Italy’s colonial racial policies, they were harsh even by the standards of a racist age. Eritreans were forbidden formal education beyond the fourth grade, a policy extended to mixed-race children in 1937, and even then it did not reach many Eritreans with less than 5,000 children enrolled in schools. It should be enough for an Eritrean to write his name (all students were boys), understand spoken Italian, perform very basic mathematics, and name Italy’s greatest heroes (chief among them, of course, being Benito Mussolini). Mixed-race marriages would also be outlawed in 1937, as Mussolini drew ever closer to Adolf Hitler’s lunatic philosophies. 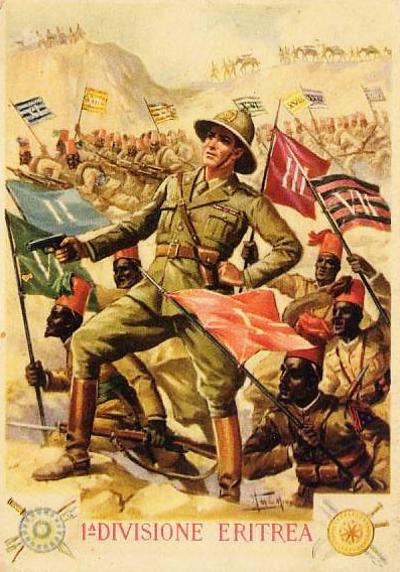 With no educated population on which to draw, Italy commissioned no Eritrean officers in the colonial forces, in contrast to other colonial powers. Eritreans could serve as senior non-commissioned officers, but could not command any white man no matter how lowly the white soldier’s rank. All officers of Eritrean units, and most of the non-commissioned officers, were Italians. As shown in our Conquest of Ethiopia game, Italy could not have conquered Ethiopia without its Eritrean troops, but they were by no means even junior partners in the enterprise. Italy’s colonies, and their inhabitants, existed to serve Italy. Click here to order Conquest of Ethiopia! Please allow an additional four weeks for delivery.